Often people speak about Languedoc-Roussillon as a whole region, and although they touch each other, both regions are very distinct and somewhat very different. In fact, Roussillon has always been assimilated to Languedoc and swallowed into its reputation, due to its small size and low-key profile, yet it should be more recognized for the quality of its wines and the beauty of its landscapes, but remains one of the most underrated and fairly unknown French wine regions. Not to be mistaken with the Languedoc’s little village of the same name nestled in the Vaucluse département, Roussillon (also called Rosseló in Catalan) is one of the historical regions of the former “Principality of Catalonia”. It corresponds to the most southern French département (or district) called Pyrénées Orientales (eastern Pyrénées), bordering the northeastern part of Spain and consequently the "Empordà" Spanish wine region. The Catalan speaking community also locally nicknames the region of Roussillon, as French Catalonia (in France) or Northern Catalonia (in Spain). Most of the agricultural and touristic activities of the area converge toward the region’s capital, Perpignan, an ancient commercial port turned into a cozy city by the Sea. From west to east, the region consists of the eastern Pyrénées foothills gradually plunging in the Mediterranean Sea; offering beautiful, sunbathed, arid hilly landscapes, constantly influenced by the rough, dry, sunny climate, barely tempered by the cooler breeze of the Sea. Understandably, the region also encompasses many types of soils and more especially many micro-climates, cooler in the mountain foothills and warmer toward the Sea. The overall climate is obviously influenced by the Mediterranée, but also by the Tramontane, a strong, dry cold wind coming from the northwest, which accelerates as it passes between the Pyrénees and the Massif Central before reaching the lower western Languedoc and the Roussillon, then Spain’s Catalonia and Balearic Islands. From the hills of Corbières (north of the region) to the Pyrénées Mountains (to the west), Roussillon is surely one of the sunniest regions in France. The climate, the history and the traditions of Roussillon make it more similar to Spain than Languedoc. Somehow, even to this day, Roussillon has yet to find its true identity between France and Spain, but logically and proudly claims its Catalan origin before all. Carignan is the most widely planted grape variety in Roussillon. A local grape called Lladoner Pelut is also used in small quantity along with the more recognized Cinsault, Grenache, Syrah and Mourvèdre. Red(s) wines are generally rich, expressive, earthy, more or less spicy and medium to full-bodied. Rosé(s) are usually ripe and fruity. White wines are mostly made with Macabeu (also known as Maccabéo), Grenache Blanc and local Malvoisie. All three types of wine are ideal for the Mediterranean cuisine prepared with a twist of Spanish-Catalan flavors. and Grand Roussillon which is an appellation reserved for the production of sweet wines made from at most 10% blend of Carignan. Cinsault, Syrah and Palomino and at least 90% blend of Muscat d’Alexandrie, Muscat à Petits Grains Blancs, Grenache Noir, Grenache Blanc, Grenache Gris, Macabeu and Tourbat. Grand Roussillon covers about 89 villages, but doesn’t include the sweet wines from Banyuls, Rivesaltes and Maury, neither the dry red from Collioure, which have their own specific and respective appellation due to the recognized higher quality of the produced wines and the particularities and characteristics of the Terroir within each of these 4 appellations. Overall, Roussillon is without doubt a very interesting region that is more reputed for both its red and white sweet wines, rather than for its rich, earthy dry reds and few whites. For the sweet wines, the grapes most predominately used are Muscat Blanc, Muscat Romain and Grenache for sweet white(s); and Grenache, Carignan, Cinsault and Lista for sweet red(s). We could also talk about Maury, which produced some of the most exquisite sweet wines of the area; however, for today’s post, I will only bring your attention to two small fisherman villages, Banyuls and Collioure, located near the border of Spain, roughly touching the northern part of the Empordà, the wine region in the extreme northwestern part of Spain. Collioure produces small quantities of dry, rich reds that are often difficult to find in the US, due to small demand and lack of promotion. Yet if you can find one, you should try it for your own knowledge and personal experience. The one from Domaine de la Casa Blanca is very nice. Banyuls is better known and usually more available in the US, although, here again, production is very limited and prices can go quite high depending on the producer (or winery). 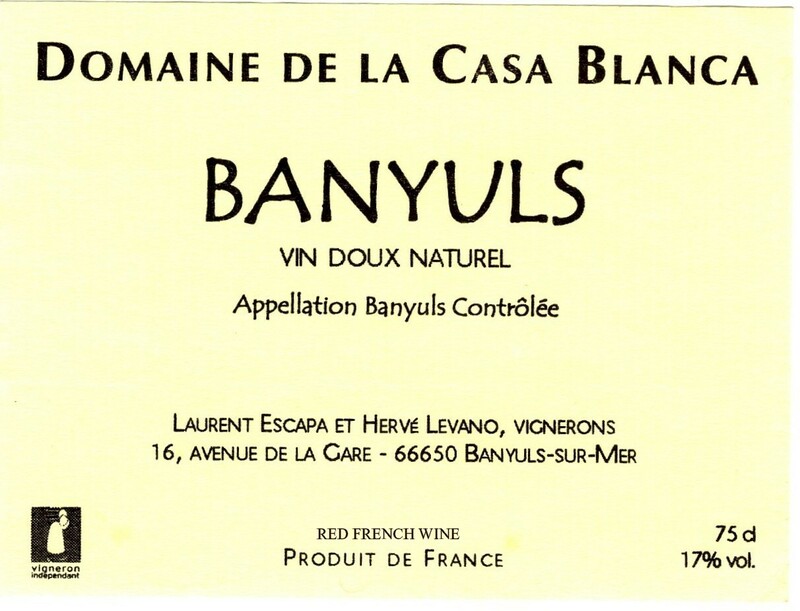 For example, "Domaine de la Casa Blanca Banyuls" is often twice less expensive on the shelves than "Cave de l'Abbé Rous "Helyos" Banyuls", which also happened to be another one of my favorite producers of the area. For both appellations, the vines grow on terraced, schist stones hillside vineyards located in this particularly mountainous region flanked against the Mediterranean Sea near the Spanish border. The steep slopes and very poor, shallow soils combined with constantly buffeting winds off the sea and the mountains make grape production difficult but yield great wines. The vines grow low to the ground, usually forming a bush in order to protect the grape from the heat during the day, and each vine must be individually planted, tended and harvested by hand. Yields are astonishingly low, at most 20 HL/HA, some of the lowest in France, which explain the limited production. These factors create optimal conditions for producing concentrated grapes, bursting with sugar, and balanced with acidity. The land suitable for growing vines is rather small: 1400 ha for Banyuls and a mere 400 ha for Collioure. For these reasons, the sweet red wines of Banyuls and the dry, concentrated red wines of Collioure are some of France’s finest and most sought after appellations. 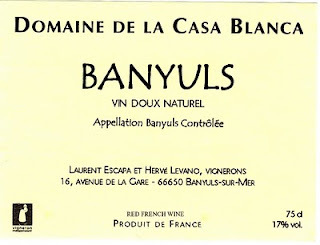 Not to be mistaken with the Casablanca Wine Cellars winery in Oregon or even the Casablanca Valley in Chili, “Domaine de la Casa Blanca” (meaning “Domain of the white house”) is probably one the oldest family domain in the AOC, producing both Banyuls and Collioure. Founded around 1870 in the village of Banyuls-sur-Mer, Domaine de la Casa Blanca is located in what is locally known as the “Côte Vermeille”, about 40 kilometers south of Perpignan. Two partners, Alain Soufflet and Laurent Escapa, originally owned Domaine de la Casa Blanca. The domaine was in Alain’s family since 1883. Prior to 1983 his family sold grapes and wine to a Négociant. Alain began working the family domaine around 1983, and in 1989 he bottled the first vintage under his own label, Domaine de la Casa Blanca. Just recently, Alain retired and sold his share of the business to Hervé Levano who has worked closely with him at the winery for over five years (before Alain’s retirement). Up to the 2003 vintage, wines were still labeled with Alain Soufflet and Laurent Escapa as vignerons. However, all other vintages since 2003 have been labeled with the names Hervé Levano and Laurent Escapa. Consisting of 10 hectares of carefully tended vines ranging in age from 70 to 100 years, this family domain is run by Herve Levano and vineyard manager Laurent Escapa. Their goal is to craft generous, intense, flavorful wines that reflect the uniqueness of the Terroir and the character of the poor schist soils, by combining the best of traditional wood ageing methods, with innovative modern techniques involving a few temperature controlled vats. Their winery is in a small garage in the middle of the village of Banyuls, therefore all the action occurs in the vineyards which they work with their mule PomPom. They produce earthy, Terroir oriented dry (Collioure) and sweet (Banyuls) red wines that have received numerous awards and recognitions from the international press and critics. Once used, chemicals, herbicides and artificial fertilizers were slowly replaced by natural compost and use of organic matters since 1989. Work is is conducted in the cellar and more importantly in the vineyards under sustainable and organic non-certified but rather adapted methods, to craft the most expressive and natural wines possible. Banyuls is a natural sweet red wine (VDN: Vin Doux Naturel) made in the style of a Vintage Port, emphasizing the fresh fruit flavors in youth and meant for long aging. This type of Banyuls is called Rimage in the local Catalan dialect (meaning fruity). Made predominantely from Grenache Noir, the grapes macerate for 2 weeks after the mutage (addition of grape spirits to stop fermentation). The wine then ages in Bordeaux (225l) and other size Barrels or "Fûts" (400 to 600l) for 12 months, which is unusual in this appellation and perhaps the secret of the great success of this domain's wine. The result is a deep, intense wine with layers of flavors, ranging from cooked plums and dark berry fruits to chocolate and spice. The finish is long, lingering and clean. Collioure is a dry red wine made from a blend of Grenache Noir, Syrah, Mourvedre and Carignan. Small yields and old vines bring out the essence of these varietals while aging in oak casks adds roundness to the wines. The bouquet is immediately attractive, like a bowl of freshly crushed raspberries. The palate is very concentrated berry fruit with a velvety texture due to the ripe, mature tannins. A deep, complex wine. I personally tasted this Domaine for the first time about 6-7 years ago, and I have always been impressed by the quality and consistency of their Banyuls, one vintage after another. The 2005 vintage is no exception to the rule. Made from roughly from 80% Grenache Noir and 20% Grenache Gris from old vines of about 80 years of age, this Banyuls is of Rimage type (meaning fruity). The grapes were pressed and alcohol added to the must in order to stop the fermentation. 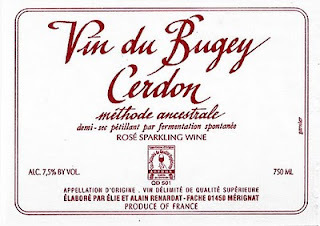 This method produces a “Vin Doux Naturel”, a wine with natural residual sugar. The wine then underwent a 15-day maceration for maximum extraction. After the maceration, the wine was then aged for 12 months in older French oak barrels of 400L and 600L size "fûts". The 2005 Domaine de la Casa Blanca Banyuls presents a dark, intense ruby color with light brick reflects. The nose is very expressive with ripe cherry, raspberry, and prune in their eau de vie with earthy, warm, spicy notes. The palate is surprisingly balanced and not overly sweet, at least not syrupy or too thick like a Maury or a Pedro Ximenez could be. It is rather complex and rich, yet soft, well rounded and harmonious with dark cherry and raspberry fruit flavors intermingled with notes of minerals, earth, cocoa and liquorice complemented by spicy, integrated oak hints. The finish is long, inviting and fresh with the same ripe wild berries taste, and a very good tannic structure with good ageing potential. People often say that it could last for 15-20 years a least, I will say that it is already succulent now as it is after decantation, yet it will definitely nicely evolve and settle down over the next 5-6 years. Great as an aperitif or a digestif, room temperature or slightly cool (but not cold), it will be ideal with chocolate, dark and red berry tart or cake, like a Clafouti, or even red berry sorbet. Perfect for Easter (or Pâques in French). Tenuta del Conte, estate bottled by Azienda Agricola Parrilla Francesco, is located in “Cirò Marina (KR)”, a little village in the northeastern part of Calabria, the most southern part of Italy (also known as “the front part of the Italian boot”), about 38 kilometers north of Crotone. Tenuta Del Conte vineyards, managed by Francesco Parilla, tempered by the Ionian Sea, extend to reach the sinuous hills and the shining plains of Cirò marina. Calabria, which was once called “Enotria” by the ancient Greek, has always been a vine growing and winemaking region with wine roots dating back to the 8th century B.C. The vines of Tenuta del Conte were planted between 1960 and 1965 with the native grapes “Gaglioppo” and “Greco bianco”. Harvests are gradual and usually only start when the grapes reach ideal maturity. The vinification and fermentation processes take place through synergy between traditional process and state of the art innovative technology to preserve all the qualities of the fruit and produce the most authentic wine possible without too much human or oak interference. Weather conditions, due to the geographical exposure and the influence of the near by Ionian Sea, make the resulting wines tasteful and often characterized by unique, Terroir oriented flavors. Made from carefully harvested 100% Gaglioppo grapes, the fermentation occurred in stainless steel tanks at controlled temperature, then the wine, once bottled, spent another 7 months of refinement period in the bottle and was released ready to drink on the market. The color is quite full and dark ruby red. The nose boasts aromas of cherry, black, current and other wild dark berries, intermingled with earthy notes. The palate has the same type of flavors, with balancing acidity and good tannic structure. Friendly and easy going, with ripe fruits and earthy tone, it is definitely a food wine to pair with game, grilled or roasted meat, cheese and, of course, specialty dish like Calabrian lamb chops cooked with bell peppers. The other day, we had the great privilege to welcome at the store Emanuela Stucchi Prinetti from the renowned Tuscan winery “Badia a Coltibuono”. We just bought 3 of her wines and she happened to be in New York to promote her estate’s portfolio. Like pretty much everything they do at “Badia a Coltibuono”, as far as I can read and taste, their wines are well crafted and inviting, and their website is also full of info, very interactive and well designed. Therefore, I invite you to go and visit it at www.coltibuono.com , to find out more about this Tuscan organic jewel. The ancient estate, which is in fact an old Abbey, is located in the upper Tuscany, near Montegrossi, in a gently rolling hills area about 68 kilometers southeast of Florence (Firenze) and about 36 kilometers northeast of Sienna. One of the oldest and most established estate of Tuscany’s Chianti Classico region, Badia a Coltibuono estate (which means Abbey of the Good Harvest) exists since the middle of the 11th century. In 1051, the monks of the Vallombrosan Order, a Tuscan reform of the Benedictines, founded the Abbey and also began planting the first vineyards in the Upper Chianti area. Slowly extending their vast land holdings, which include many thousands of acres, they developed a flourishing wine production and commerce. In 1810, when Tuscany was under Napoleonic rule, the monks were forced to leave Coltibuono and the monastery was secularized. First sold by lottery, Coltibuono was then bought in 1846, by Guido Giuntini, a Florentine banker and great grandfather of Piero Stucchi-Prinetti, the present owner. During the years the estate was still under the guidance of Piero Stucchi Prinetti, the estate grew and developed a solid reputation in Italy and abroad through the high quality of its products. Nowadays, his children Emanuela, Paolo and Guido continue the activities embarked upon by their ancestors with the same dedication, enthusiasm and careful attention to details. The estate offers many services and products including: Agritourism, Bed & Breakfast, Cooking classes, Restaurant, Olive Oil, Vinegar and Wine, of course. The best of it, they do everything the organic way from their kitchen in the restaurant and classroom, to their fruit and vegetable orchards and more importantly their vineyards and wines. Agroturismo in Italian, or Agritourism in English, which was once a peculiar and disparate thing in the European countryside and a few rare parts of the rest of the world (still a few years ago), has flourished a great deal over the last 5-10 years with the organic/biodynamic/sustainable movement and more especially the need for the ever-busy-big-town people to find a peaceful place where they can rest and enjoy the local traditions and products, without having to pay the demanded astronomical prices of some of the family and luxury resorts and hotels through out the world. Moreover, it is usually more practical and enjoyable for families or group of friends that also would like to visit and learn about a specific area without getting the frantic attitude of the other surrounding tourists crowding the same usual visited places. In most cases and in fact, it is like renting a house or a room in the middle of nowhere, or on the contrary somewhere remote and out of the usual beaten path, to be able to truly experience the area plunged with the locals, their traditions, culture, recipes and local products, without feeling like the average Joe lost in a mass of other American tourists (or else) that have made the same decision and ended up at the same cheap resort (Come on! You’ve been there… you know what I mean…). You should try, Agritourism is fun and often eye opening, and people are usually more open and easy to deal with because they see that you want to participate, discover and embrace their native habits and ways of living, rather than just be an annoying tourist. To get back to Coltibuono, we used to carry their 2006 Coltibuono Chianti Classico that we liked very much; however, we just bought their current releases, 2007 and 2008, and like them even better. Without falling into bad generalization, I can firmly say that from all the wines that I tasted in the store and different events, the 2007 vintage in Tuscany, Piedmont and overall in all the northwestern part of Italy, is, in my opinion, a great vintage rivaling with the 2001 and 2004 vintage which, (here again, in my opinion), were surely the other two best vintages of the last decade for these long established Italian regions. Although the 2009 vintage seems promising, yet it is somehow too early to say because most aged wines won’t hit the market until the end of the year 2010 for some of the earliest and spring 2011 for most of the other. Despite their more traditional wines sold under the classic “Badia a Coltibuono” brand (or label), the Stucchi family also has a commercial line sold under the name of “Coltibuono” only (a brand or label, including the following “Cancelli” and “RS” wines). Enhanced by the family oenological expertise acquired over the years, the “Coltibuono” label offers a portfolio of wines selected from the best areas of Tuscany that are also distinguished for their good quality/price ratio. 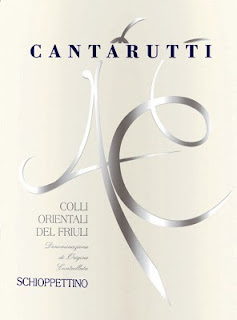 Fairly new to Coltibuono portfolio, “Cancelli”, (named from the drawing on the label which represent an ornamental or structural interwoven framework, like an arrangement of dark crossing laths), is a blend of 70% Sangiovese and 30% Syrah from Tuscany yet outside the classic DOC appellations. Fermented in stainless steel tanks, this wine wasn’t aged in oak at all and underwent a short period of refinement i9n the bottle before release. The addition of Syrah completes the wine with more stuffing and confers a modern touch to it, without totally imparting the taste of this less traditional yet still earthy, approachable and juicy Sangiovese. At this price, it is a great everyday value offering nice, ripe fruit and a straightforward mouthfeel with a gentle finish. Better within the first 2-3 years after bottling, pair this organic, friendly wine with pretty much everything. The initial “RS” on the label stands for “Roberto Stucchi”, brother of Emanuela and Guido's great-great grandson, who is the in-house oenologist and co-winemaker. Part of the “Coltibuono” label, this Chianti Classico is a great approachable Chianti that has character and attitude with generous fruit and substantial tannins. The acidity really enhances the fruit and balance the overall profile. The selected grapes went through separate vinification process depending on the parcels of origin and desired extraction, then the obtained wines were aged for a few months in French oak casks and barriques from the Allier forest. Once blended and bottled, the final wine rested for an additional a period of refinement in the bottle before release. 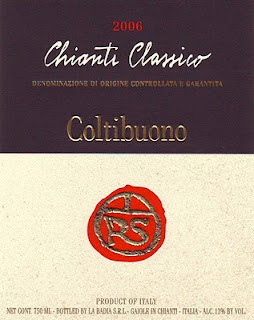 2007 Coltibuono “RS” Chianti Classico exhibits a bright, youthful ruby color. The nose is quite expressive with wild summer berries, spices, leather and dried plum aromas with earthy notes. The palate is rather fruity, soft, well rounded and balanced with refreshing acidity and lingering finish with present yet integrated tannins. Overall, a very pleasing wine offering plenty of layers for a Chjanti Classico at this price. Benefiting of the ICEA certification since 2003 (the Institute for Ethical and Environmental Certification, better known in Italy as “Instituto per la Certificazione Etica E Ambientale), this wine is the result of entirely natural production methods using handpicked organically grown Sangiovese and Canaiolo grapes from Badia a Coltibuono vineyards. It is considered to be one of the most representative wines of the Chianti Classico appellation. The wine was crafted with 90% Sangiovese and 10% Canaiolo from vineyards located in the erea of Monti in Chianti (SI) including Poggino, Vignone, Montebello and Argenina parcels. Vineyards are located between 250-320 meters above sea level and benefit of a South, Southeast –Southwest, orientation. The vines averaging between 10-55 years old are planted on mainly clay with limestone rocks soils. This wine was aged for about 12 months in French and Austrian oak casks and barrels of varying sizes. 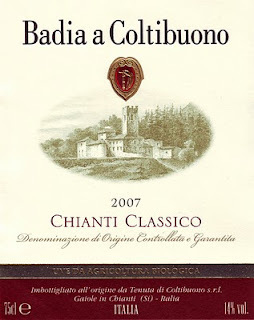 2007 Badia a Coltibuono Chianti Classico is quite complex and layered. Behind its bright ruby color of medium intensity, the nose reveals attractive floral and fruity earthy aromas combining the scent of violet and roses with notes of tobacco, black pepper and ripe red and dark cherry. The palate is really well balanced, yet a touch tight and young with refined structuring tannins, mineral and earthy notes, enlightened by a cleansing acidity. The finish is long and persistent with very good ageing potential. Although quite approachable and really enjoyable now, it shows promising signs of settling down and getting even more harmonious within the next few years. Drink it with a little decantation or keep it a little to appreciate it even more. Overall, Badia a Coltibuono really surprised me by the quality and the consistency of their wines, moreover, being organic and that approachable in their youth, yet don’t get me wrong, with good potential. I hope one day to visit them in Tuscany to fully understand and appreciate all their products. “Porta da Ravessa” (or “Door of Ravessa”) is the name of the entrance to the east wall of the ancient “Castelo de Redondo”. Even today local people still speak of its great stories relating to the many merchants and acrobats that in the Middle Ages used to occupy the front of it to entertain, sell merchandises and promoted the many activities of the castle to the travelers and locals. The medieval door and the rest of its surrounding walls on both sides have been classified as National Monument in January 1946. The image of this entrance was popularized in the 90s, when it was put on the label of “Porta da Ravessa”, one of the numerous wine brands produced by Adega Cooperativa de Redondo. Adega Cooperativa de Redondo is located in Redondo, a small village located in the District of Évora, 70 kilometers west of Badajos and about 170 kilometers east of Lisboa. Since almost half a century, the Adega Cooperativa de Redondo (ACR) has been dedicated to the production of white and red wines from the Alentejo DOC, Portugal’s largest wine region, with “Porta da Ravessa” being of the most well known wine brands of their portfolio and one of the largest selling wine in Portugal. “Porta da Ravessa” is produced in red, white and rosé. The red is a blend of Trincadeira, Aragonês, Alicante Bouschet and Castelão, harvested from vines planted on essentially Granitic soils, complemented by patches of calcareous clay and schist, conferring great minerality and earthiness to this wine. The wine didn’t see any oak and was entirely made in state of the art, latest technology temperature controlled stainless steel tank to keep the maximum of freshness and fruitiness. This wine has a medium to deep ruby color, with clean, earthy aromas of ripe red and dark berries. The palate is nice and simple, with the same type of flavors. Overall, it is lively and young, reminiscent of freshly crushed grapes, with a round, velvety mouthfeel. The finish is dry and earthy yet quite juicy. Just another great value from Portugal to enjoy with or without food. As I already mentioned it in a previous post, Marqués de Vitoria features amongst some of my favorites traditional Rioja's wineries, which include: La Rioja Alta (Vina Ardanza), Lopez de Heredia (Vina Bosconia and Tondonia), Bodegas Riojanas (Gran Albina), CVNE (Vina Real), Marqués de Murrieta (Castillo Ygay), Marques de riscal (Reserva and Gran Reserva), and a few more rare gems. However, being a part of the massive Faustino group, which owns quite a few wineries and hectares of vines in the Rioja region, Marqués de Vitoria is very often underrated by the press and overlooked by most Spanish wine lovers as a less established or more commercial brand. Somewhat not always working for the reputation of the brand, these unfortunate downside facts allow great opportunities for connoisseurs and amateurs like you and I, to still enjoy the wines from this Bodegas at a great price, which works best for our wallets. In a previous post, I talked about the 2004 Marqués de Vitoria Crianza and the 1996 Gran Reserva, which were really good, yet once again, Marqués de Vitoria impressed me with its old school, integrated, earthy attitude 2001 Reserva. 2001 and 2004 were surely the best two vintages of last decade in Rioja overall. Although still a bit young for some Gran Reserva and Reserva Especial, the 2001 Reserva are drinking beautifully and most of the ones that I tasted are massively expressive. The 2004 are quite impressive too, yet some of them may need a few more years. Marqués de Vitoria 2001 is the last 2001 Rioja that I tasted recently and it was absolutely exquisite, especially if you prefer more traditional, earthy Rioja style like me. Created in the late 19th century by the Marquis of Vitoria, the Bodegas has a name eponymous of a city anciently known as Gasteiz (in Basque), which became Vitoria in 1181 (or Victoria in English) and it’s now the region’s capital. Bodegas Marqués de Vitoria has become one of the landmarks of the plains of the Alavese region (or Álava or Alavesa), located in Oyón, a small village north of Logroño, in the south of the Álava region. The bodegas possesses an ocean of vineyards from which they craft numerous wines: Crianza, Reserva, Gran Reserva, an organic wine called “Ecco”, an exclusively old vines made wine called “Original”, a white Rioja made with 100% Viura and a 100% Tempranillo Rosé. People may see this Bodegas as a commercial venture like Faustino, yet no one can deny the fact that both of these wineries still craft their Rioja wines with an old school, traditional twist which is far from the heavy duty, modern, super extracted and woody, massive fruit bombs that certain Rioja producers have crafted recently to please the demand of certain markets influenced by certain prominent critics. I have been a Rioja wines fan for years and being from Bordeaux, when I go back to France in vacation, I rarely missed an opportunity to drive to the Basque country in Spain for a few days, to appreciate the warm climate, the frank attitude of the Basque, the culture, the landscape and more especially to gorge myself with “Tapas”, “Chuletas” and other Basque delicacies paired with some old vintage Riojas found in some of the unknown-to-the-grand-public restaurants bordering the Basque coast or lost in one of the numerous hilltop villages, like Laguardia or San Vicente, in Rioja itself. Old school, traditional Rioja red wines are usually extremely aromatic, mixing the nuances of the toasted oak barrel long ageing and earthy, Terroir influenced touches with fresh, juicy red cherry fruit, complemented by integrated tannins. Their color is often light, see through for some with age, which, just to remind you, has nothing to do with the concentration or complexity or length. Classic Tempranillo based wines like Pinot Noir can appear to be light in color and not extracted, yet they most of the time reveal great aromas, beautiful balance and fruit concentration in the palate with complex structure and texture. Color can be a deceiving indicator, not to take for granted depending on the grape variety. In any case, Tempranillo like Pinot Noir shouldn't be too hinky or dark or too extracted. Both grapes are not Cabernet Sauvignon, Grenache or even Zinfandel and shouldn't be treated like such. They both produce delicate, balanced, juicy, vibrant wines, more imparted by the oak influence in the case of Tempranillo, I admit, but they shouldn't taste jammy or be too thick. Modern ways and demand for such heavier style wines may have become fashionable for a while, yet people will realize with time that Tempranillo (and Pinot Noir) is more about elegance, charm and earthiness mixed with harmonious oaky nuances, rather than being hugely fruity and ripe (or even way overripe for some) with tones of oak flavors. However, let’s go back to this wonderful 2001 Marqués de Vitoria Reserva, which once again startled me and confirmed my tendency to better appreciate traditional style wines compared to more modern and extracted style. Made from 100% Tempranillo grapes coming from 30 years old vines, this wine was vinified then aged for about 2 years in French Allier forest oak casks where the wine remained from roughly December 2001 to September-October 2003. It spent an additional year in bottle before release. Which make me think to remind most Rioja novices, that Rioja is one of the rare regions in the world that has kept the tradition to age wine for a long period of time (2 years in Barrel + 1 year in Bottle for Reserva; 2-3 year in Barrel + 1-2 years in bottle for the Reserva Especial and Gran Reserva). In fact, release occurs when the wine, although still young and full of promises with great ageing potential, is ready to drink and integrated enough, presenting its best youthful profile to the patient consumer. Some of us will even be more patient and keep it for a few more years until the wine reaches its ideal maturity in the bottle. The color is quite characteristic to older Rioja, medium intensity red-aged-cherry garnet with brick orange touches on the rim. On the nose, the 2001 Marqués de Vitoria exhibits ripe red and dark cherry aromas, with woody, slightly floral and earthy notes intermingled with hints of toasted oak, cedar, spices, underbrush, forest floor, coffee and few more attractive secondary and tertiary nuances. The medium to full, juicy and harmonious palate offers ripe red and dark cherry fruit, old prune and toasted layers, here again complemented by sweet integrated tannins that add structure and vibrant, refreshing acidity that nicely balance the fruit and the oak. The lingering finish is dry and inviting with good ageing potential. Pair it with grilled baby lamb Chuletas, rack of lamb, meat casseroles and stews, game and poultry, venison or even duck served with gratin Dauphinois and garlic-parsley sauteed mushrooms. Overall, a well-crafted wine from the acclaimed 2001 vintage and another fine example of what this vintage can offer and what an authentic Rioja should taste like. Some more established or renowned brands may offer more complexity and guts, thus give you a better or finer experience in this 2001 vintage, but none or few of them will offer such experience at less than $25 a bottle, except Marqués de Riscal which was amazing under $20. Domaine de L’Aujardière, is a fairly small family run estate located in "Saint Philbert de Grand Lieu", a small village in the heart of the "Muscadet des Côtes de Grand Lieu" appellation. "Muscadet des Côtes de Grand Lieu" is by the way the most southwestern appellation amongst the 4 Muscadet appellations that surround the city of Nantes, western Loire Valley. Despite the generic "Muscadet" appellation, if you look at a map, clockwise, you will find "Muscadet des Côteaux de Loire" to the northeast of Nantes, then directly east of Nantes, you’ll find "Muscadet de Sèvre et Maine" and finally southwest of Nantes, "Muscadet des Côtes de Grand Lieu", which also the closest from the Atlantic ocean and the most western appellation of the Loire Valley. Owned by Eric Chevalier, the Domaine de L’Aujardière currently possesses 28 hectares spread over different appellations, with vineyards mostly planted in "Muscadet Côtes de Grand-lieu", in "Vin de Pays du Jardin de La France" and VDQS "Gros Plant Pays Nantais". The entire vineyard undergoes certified "Lutte Résonnée" (under sustainable culture management.) They work with world-known varietals: Chardonnay, Pinot Noir and Sauvignon Blanc, all now being particularly well acclimated to this cooler Loire Atlantic region with Oceanic climate influence. Other specific varietals complement this range: Cabernet Franc, Grolleau, Fié Gris (also called "Sauvignon Gris" due to its slightly pinkish hue in the skin, which differentiate it from its sibling, the regular Sauvignon Blanc), and even some Cabernet Sauvignon. Eric Chevalier is a qualified winemaker (Oenologue). After 10 years of experience at "Vinival/Les Grands Chais de France" as head of their winery in Touraine (winemaking and Négociants activity), Eric took over the family estate in April 2006. Eric’s personal winemaking experience with the wines from Touraine, where the white wines are exclusively reserved for the careful selection and production of Chenin Blanc and Sauvignon Blanc, helped him to comprehend, better grow and achieve the production of a great "Fié Gris" (Sauvignon Gris), the flagship of its portfolio. Similarly, some training period done in Chablis, at "Domaine Laroche", facilitated the interventions and work for its Chardonnay. In the same idea, a course in the cellars of Brissac in Anjou was his first contact with the vinification of Cabernet Franc and Cabernet Sauvignon, which he has now perfected in his own cellar to produce exquisite wines from these two varietals. The specificity of the soil and sunshine of the southwestern Loire allow for a wide range of grape varieties to be produced to meet the expectations of fans of light, bright and fruity wines with great freshness. They also take the greatest attention and care during the harvest and vinification process, to adjust their natural winemaking methods to enhance the maturity of the fruit and the earthy characteristics of the Terroir and soils of the various plots. Quality is also obtain due to controlled fermentations as well as to ideal maturation and “batônnage” on fine lees, which add texture, smoothness and complexity. Their wines from specific appellations, like their single varietal wines from more generic appellations are fermented and conditioned in order to preserve the fruitiness, freshness and elegance so characteristic to this wine region. Aiming for high quality and great value, the wines of Domaine de L’Aujardière are constantly prized in national and international tasting competitions and praised by the critics and connoisseurs. Domaine de l’Aujardière produces about 6 whites (2 "Muscadet Côtes de Grand Lieu sur Lie"; a Sauvignon Blanc; a Gros Plant du Pays Nantais; a Fié Gris and the Chardonnay of today’s post); 3 reds (a Cabernet Franc, a Gamay Rouge and a Pinot Noir) and 3 rosés. As far as I could taste and in my opinion, all Eric Chevalier's wines are beautifully crafted, elegant, fresh, Terroir driven and expressive, with great delineated acidity, lots of mineral, focus and balance. More over, they are very affordable for the high quality features that they offer. Wow what a wine! Made with 100% Chardonnay vinified in stainless steel tanks only, it is the Muscadet of Chardonnay, light, bright, vibrant, lot of mineral, a touch of sea breeze in a juicy, citrusy profile, perfect to welcome the much anticipated Spring and Summer seasons after a rough, long winter. The characteristics and the shallowness of the soil allow this beautiful little gem of a Chardonnay to fully express fresh aromas of white and citrusy fruits, mineral and floral hints. This wine was produce with no commercial nor unnatural yeasts. 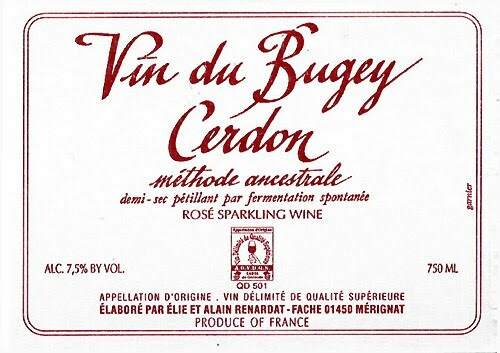 It was vinified on its lees with constant “Batônnage” until bottling. It is a simple and approachable wine, fresh, alive and ample in the palate, with a crisp, lingering and inviting balanced finish, it is the perfect wine to drink as an aperitif and to complement appetizers, fish and shellfish.